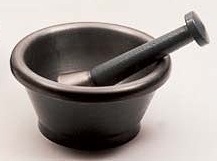 One of the oldest tools used by mankind and still very effective for grinding, crushing and mixing small quantities in the laboratory, kitchen or pharmacy. 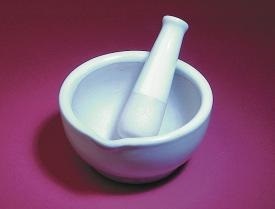 Porcelain mortars with pouring lip, glazed on outside only, oversized and with comfortable to use porcelain pestles glazed to grinding surfaces. 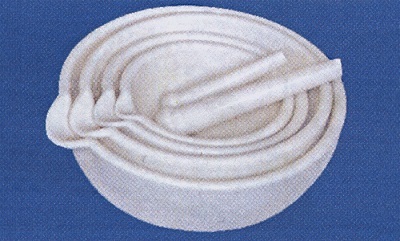 Agate Mortars and Pestles are suitable for grinding and mixing medium and hard substances. 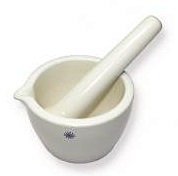 Very resistant to abrasion and contamination, the mortar and pestle are both polished all over. 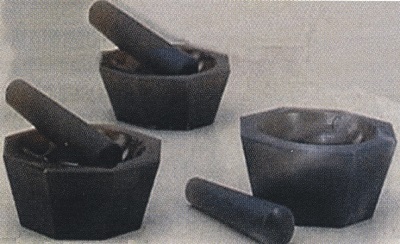 For 531 Series hardness is 7 on Mohs scale, compression resistance is 110 kg/mm2, and breaking resistance is 210 kg/mm2. For MPA Series hardness is 6.5 on Mohs scale. 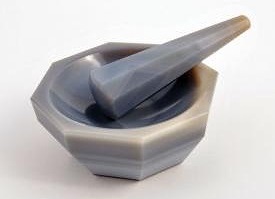 While the agate mortars and pestles could be a beautiful part of a home kitchen’s basic equipment, the units supplied by Rose Scientific are selected for superior performance in the laboratory and not on the basis of color or interesting pattern. Porcelain available diameters from 60 to 216 mm, with larger deep forms available as well, agate from 45 to 105 mm and grey iron from 130 mm to 150 mm.